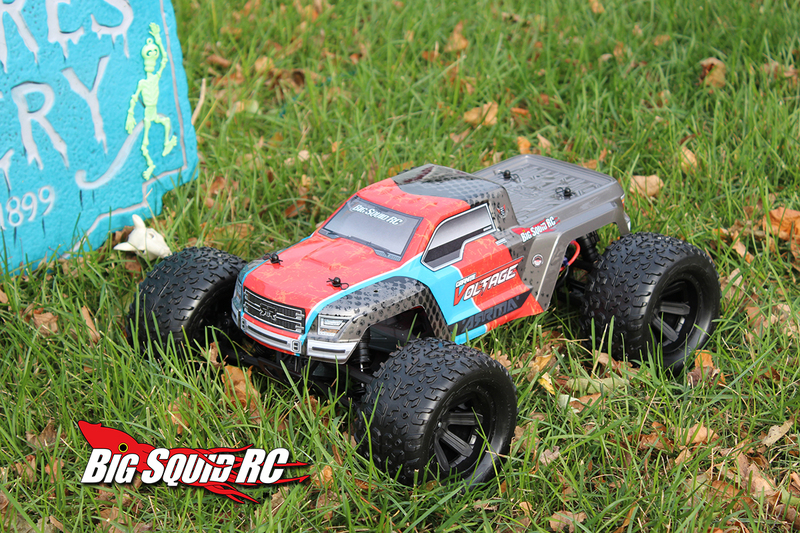 ARRMA Voltage Granite Mega Review « Big Squid RC – RC Car and Truck News, Reviews, Videos, and More! 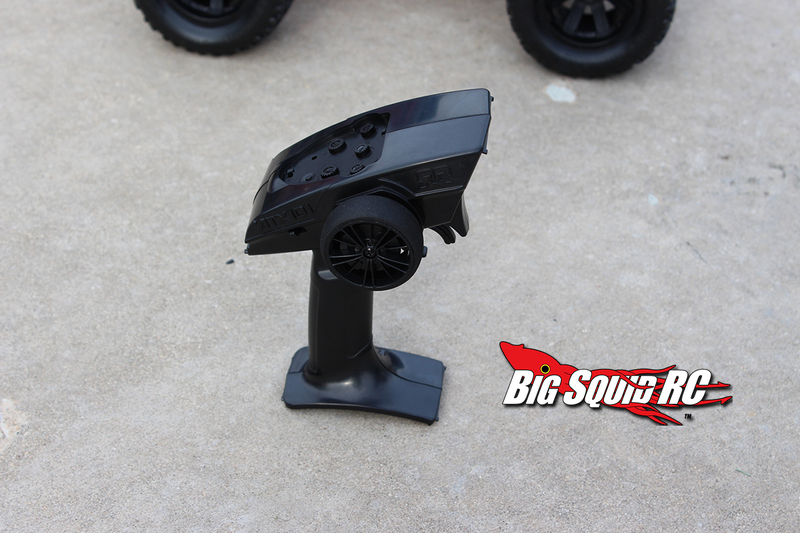 When we heard about the ARRMA Voltage Granite Mega from Horizon Hobby was getting a price drop to $99, it seemed like something we wanted to revisit. 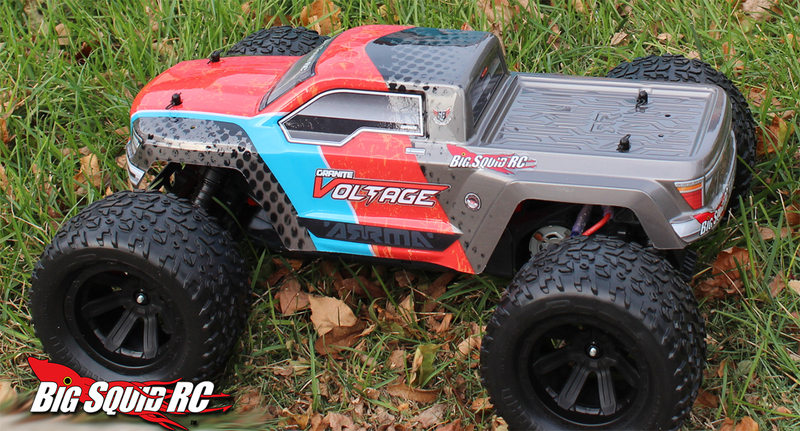 We had reviewed the ARRMA Voltage Fazon a while back, but this one is a little different. The Granite comes with Lithium Ion batteries which is something that is still very new for the hobby. Is it a good starter truck? How fast is it? Keep reading to find out. Primary Competition: We are putting the Voltage Granite in the beginner category. 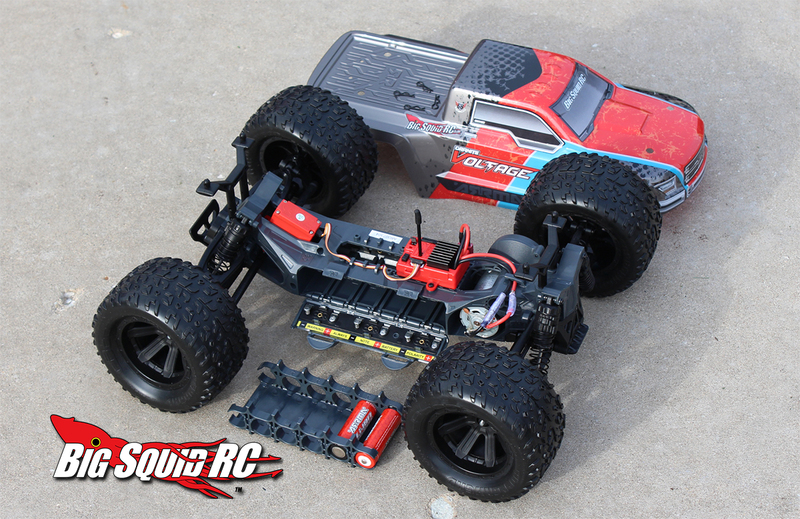 So direct competition are vehicles like the ECX 1/10 AMP and maybe the HPI Jumpshot MT. What’s Needed To Complete: The Granite comes with a pair of Lithium batteries to power the truck, all you need is four AA cells for the transmitter. You will eventually want to upgrade to the full 6 LiOn batteries to get that run-time up. Build Quality: We didn’t find any issues out of the box. We actually had two Granites and two Fazions and none of them had any problems out of the box. Test Drivers: Wrench, Tommy, Jeremy, Mini wrench and myself. 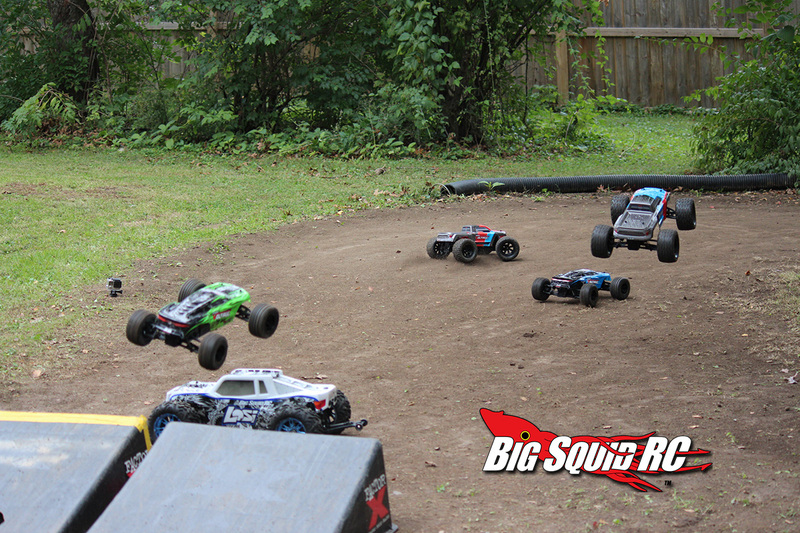 Test Venues: For testing we hit our home town favorite Juicebox Off-Road Park, a few parking lots, streets, backyards. Set-up Notes: We left everything stock for our testing purposes. The ride height, along with all suspension settings, were left stock. 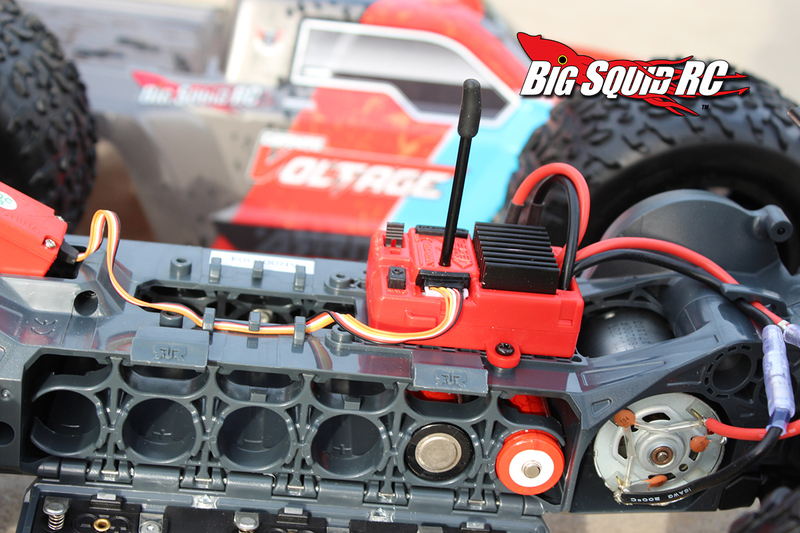 We added four MaxAmps AA cells into the transmitters, then used the stock Lithium Ion batteries to power the trucks. All charging was done with the included chargers. We did test the truck for a bit on 2 Lithium Ions, but most of the runs were done on 6. Turning: The trucks turned surprisingly well for being $99 vehicles. We expected the servos to be under powered, but they had more than enough to get us around the tracks without a big amount of under-steer. Not once did we think we needed more steering. The tires handled well in the dirt and we even had enough power to kick out the rear end in the corners. Jumping: The truck is well balanced, and we didn’t have any issues hitting the ramps, jumps, hills and curbs while keeping it on all 4 wheels. There was rarely a need to try and adjust in the air, it was mostly smooth sailing up there. We hit jump after jump after jump and we were never had any unexpected jumps or issues trying to land. Bumps/Whoops: The suspension did a fine job in the rough stuff, and the light chassis made easy work for just about all the terrain we encountered. The Granite is a mid-motored setup, so no worries about landing on the motor. On-Road: While the street isn’t what these vehicles were made for, you can still have fun out there. We didn’t notice any excessive wear to the tires from running on pavement. The Granite can traction roll so be mindful of those quick turns before your doing the walk of shame down the black. Grass: The truck had no problem is the short grass, but you will probably want to stay out of the deep stuff. Tires: The tires look good and did very well in the soft dirt. They held up well throughout our testing with very little wear. They tires are a bit hard, and might not be idea for the harder dirt. Power: With a top speed of 25mph, and more than enough to create roosts in the dirt, we were overall very satisfied with the stock power setup. Radio: Don’t let the strange look of the radio scare you. The unit is quite small, but worked fine for us. Even though the radio has a small form factor, most of our guys were just fine with its ergonomics. After a few minutes you will forget what you are even holding in your hand. It has all the adjustments that you really need the batteries seem to last a long time. Broken Parts: Out of the 4 vehicles we bashed and beat up on, we ended up breaking one of the plastic out drives.This was after a LOT of bashing. It is a cheap part to replace, and surprisingly easy to do. The most interesting part of the Granite Voltage are those Lithium-Ion batteries. 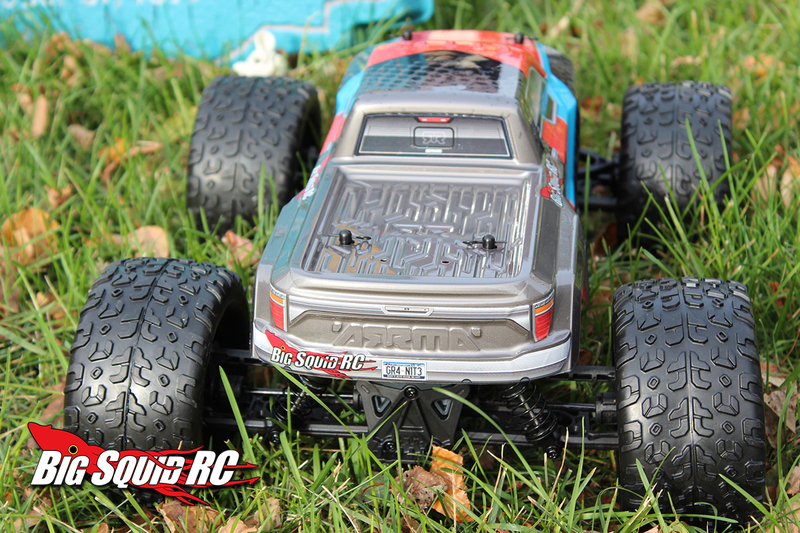 Instead of coming with a “standard” NiMH pack, the ARRMA comes with a pair of 18650 Lithium-Ion cells (with a USB charger). The cells are 1500mAh each. Stock, you insert the two Lithium cells into the truck. At that port you are running 2S. You can run up to 6 of the Lithium cells at once. As you add more cells, no, you don’t get any more voltage as they are wired in parallel, but you do increase run-time. We measured run-time at right at 6 minuts on just 2 of the Lithium cells and over 20 on 6. What if you don’t feel like using the supplied batteries? That’s right, you can also use “normal” packs in the Granite if you want to. A Deans connector (awesome!) comes stock. Did we mention it’s Mid-motored? Another great feature! While putting a motor in the middle of a truck/buggy does have handling benefits, we are more excited that the motor on the Granite is tucked safely out of harms way for durability reasons. For $99, it would be difficult to come up with another vehicle you could have so much fun with. 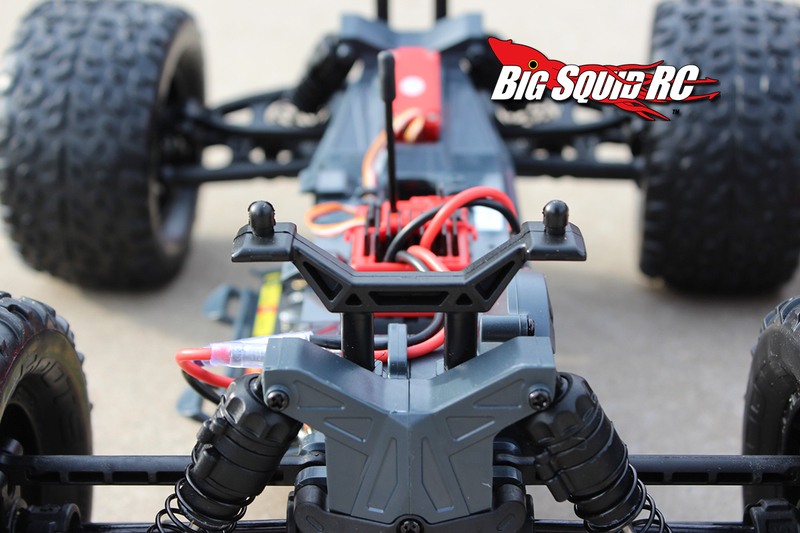 It’s a great beginner truck with the safety of the LI-ION batteries and charger while still getting you some great speed. 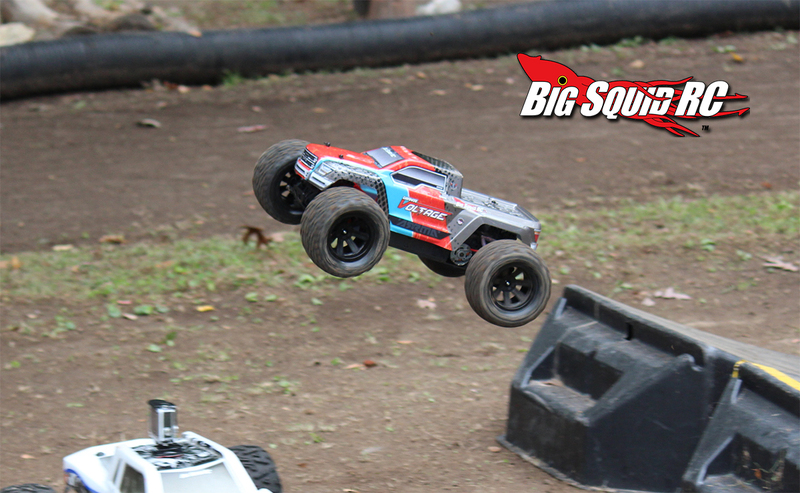 The Big Squid RC crew spent the day at Jeremy’s Juicebox Off-road Park on the dirt oval track and had a blast. We seriously had a great day of bashing with the trucks. They were fast enough to force you to pay attention to what you were doing, and tough enough that nobody broke anything during our demo derby which included launching the trucks towards each other at full speed off the ramps. (Watch for that video coming soon!) We then beat the trucks up in the parking lot as well as at the Rocky Mountain Hobby Expo on the big metal moto ramps! 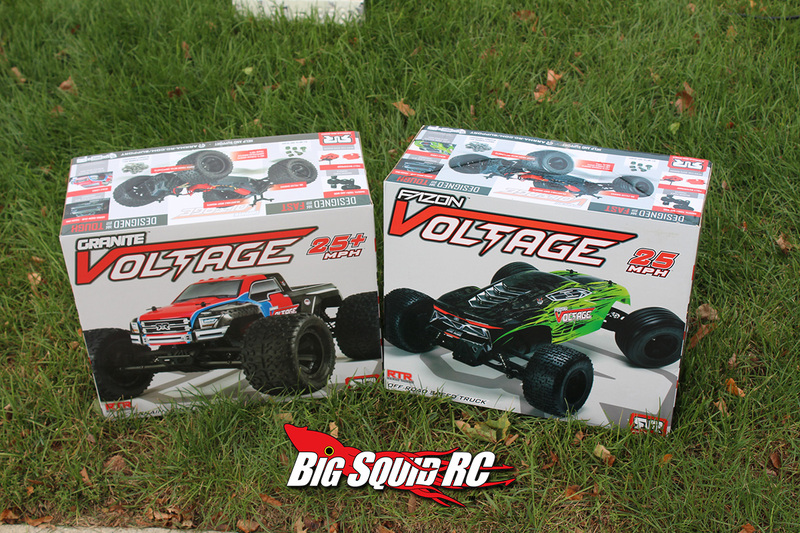 If you have someone in your life you’d like to help get into RC, the ARRMA Voltage vehicles are a great jump in vehicle. You can find them on Tower Hobbies, Horizon Hobby, and even Amazon! Time to pick up some of the Christmas gifts. Best Mod: Probably some Duratrax Six Pack MT Tires. Time To Bash: B The Granite comes RTR, add 4 batteries to the transmitter, put in your charged battery pack and you are rolling. If you are using the Li-Ion batteries, you are going to be waiting a while as charging them can be pretty slow with the included charger. 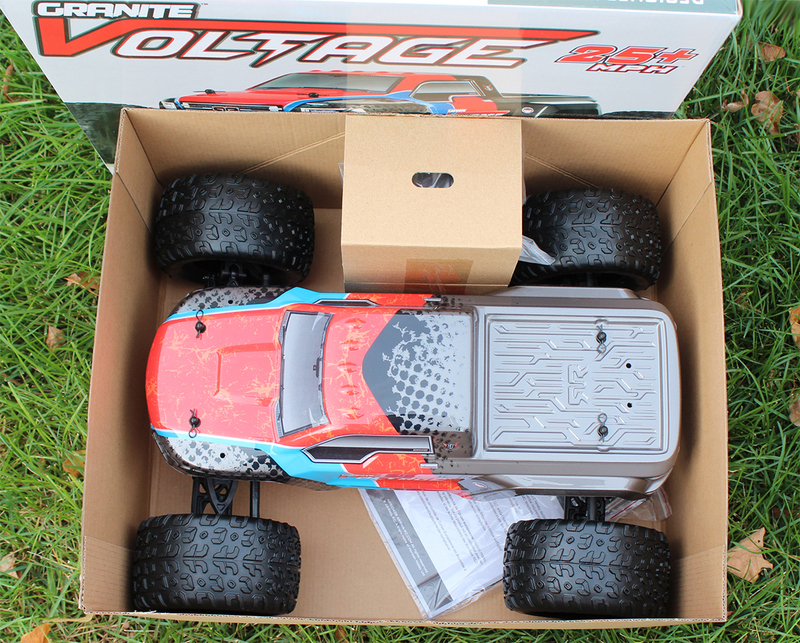 The truck comes with 2 Li-Ion batteries but you’ll need 6 if you want to run more than a few minutes. Workability: B We would much rather see hex hardware but the Phillips hardware held up ok and we were able to wrench without issues. Car Show Rating: B+ Many of the crew were impressed with some of the details and look of the Granite body. For the price point, it’s a good looking vehicle. Bash-A-Bility: B+ We were able to beat up on the trucks pretty hard. We had 4 vehicles for testing, but at the end of the day, we did loose one rear diff and eventually a outdrive. That being said, it’s amazing no other parts were broken after numerous on-purpose full speed head on collisions. 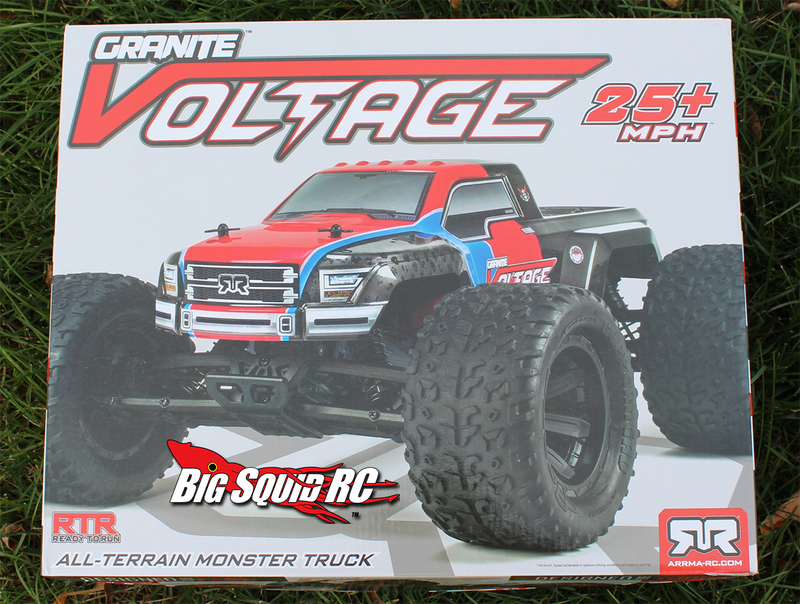 Fun Factor: A WWe had a blast bashing the ARRMA Granite Voltages. This might be one of those times where things are more fun in pairs. We kept going back to the vehicles and coming up with other crazy stunts to try and break them. Handling: C Overall the truck handled quite well. The traction from the tires was good enough. 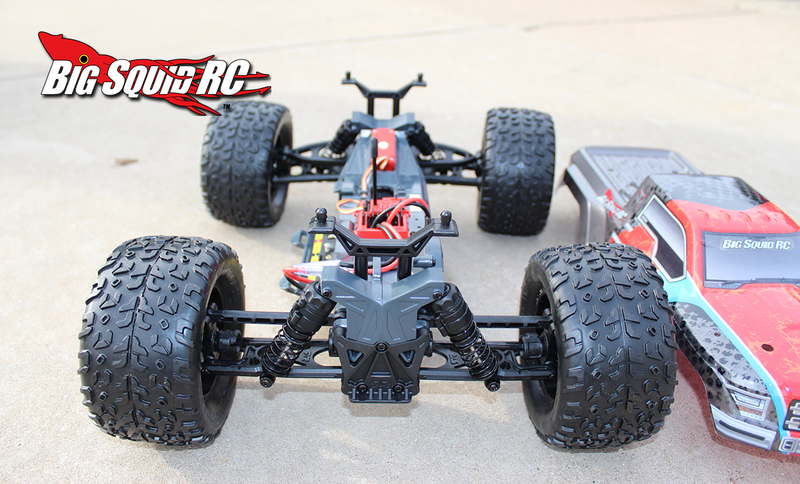 Value: A At $99 it’s tough to come up with a more fun vehicle at that price that can take a good bashing and bring a smile to even a seasoned rc’er. 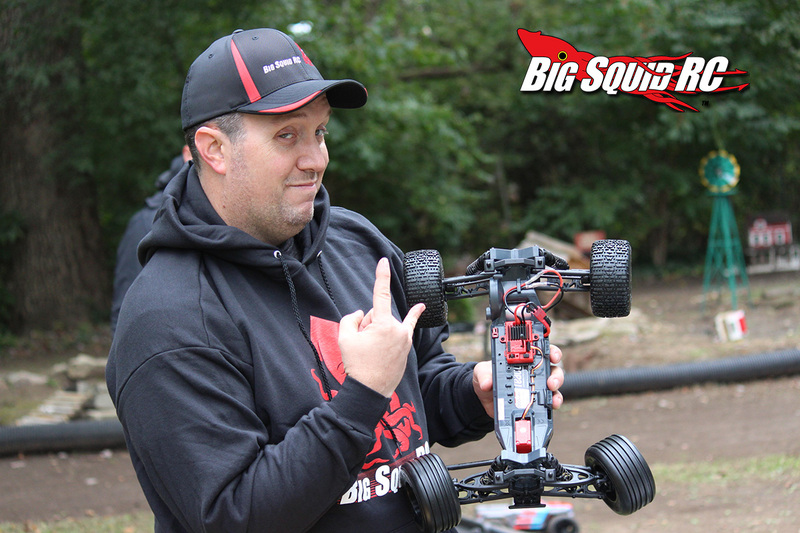 BigSquid Rating: B+ The whole crew was impressed with the ARRMA Granite Voltage. 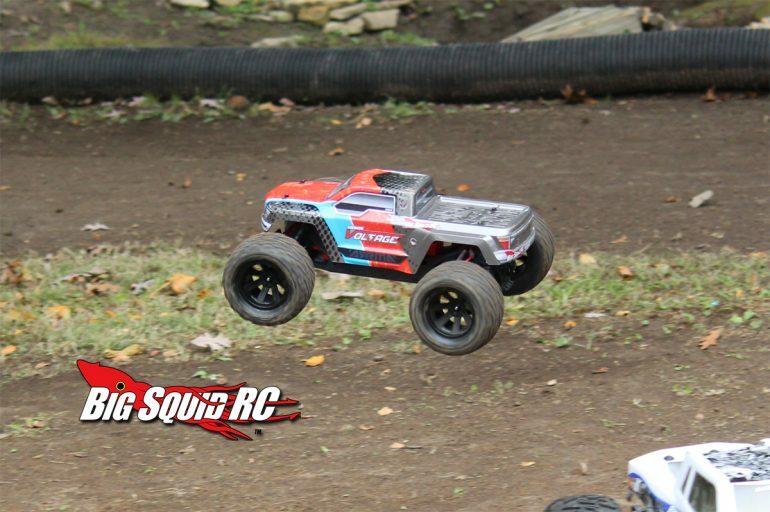 If you are in need of a Christmas gift, or are just looking to get someone into the RC hobby, the Granite would be an excellent start.